Hayward Gallery reopens in January 2018 with the first major UK retrospective of the work of acclaimed German photographer Andreas Gursky. Known for his large-scale, often spectacular pictures that portray emblematic sites and scenes of the global economy and contemporary life, he is widely regarded as one of the most significant photographers of our time. 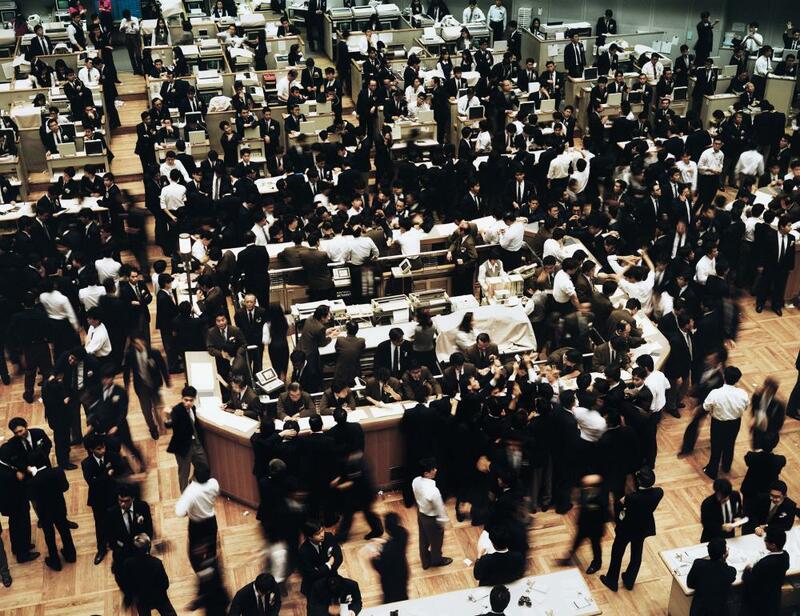 Over the last two decades, Andreas Gursky has become the most significant image-maker of our time. Not just for the topicality of his subject matter – the scale and reach of global capitalism, the thrust of 21st-century commerce and the fragility of the planet – but for his grand-scale, digitally driven reinvention of the very notion of the photographic image. In his epic panoramas, from the frenzied activity on the Chicago stock exchange to the painterly stillness of the Rhine, nothing is as it initially appears. Often what you are seeing is a digitally created composite image: several photographs seamlessly knitted together. It is photography but not as we know it. Indeed, if you look closely at certain images – May Day IV, for example, his depiction of a vast German rave – you can pick out the same person appearing more than once. In the vast Ocean 11, satellite images are used in the creation of an overhead shot of an area so enormous it defies “normal” photography. Gursky’s digitally enhanced, almost godlike vision is the main reason he so disturbs traditionalists. But the issues of authenticity that concerned many of his contemporaries as they made the move from analogue to digital seem never to have entered his mind. In the refurbished Hayward – where not much has changed in terms of the gallery space except that everything looks brighter and less brutalist – Gursky is a perfect fit. Before one encounters the almost overwhelming magnitude and hyperreal detail of his signature works, there are several more traditional landscapes from his formative years as a graduate of the Düsseldorf School. In Gursky’s deftly revealing studies of Germans engaged in leisure pursuits (walking, swimming, skiing), the tiny human figures populate the often vast landscapes as if arranged by his hand. His compositional skill is evident throughout the exhibition, giving the pictures a choreographed aspect that becomes more grandstanding as his creativity is fired by digital technology. There are several surprises, not all of them to do with size and startling detail. Like all great artists, Gursky possesses an implicit understanding of scale. His image of a Madonna concert, an event as big as the May Day rave, is printed much smaller than the latter so that one has to lean in close to pick out the tiny figure of the singer on stage. The detail of Madonna’s arena concert is still somehow palpable even when pared down. It is as if he is making a point: size matters at both ends of the scale, the epic and the intimate. More mischievous still is Kodak, his oddly unreal take on an office block belonging to the photographic company, whose colour film so defined our way of seeing in the pre-digital age. Through Gursky’s eyes, it looks like one of those intriguingly blank models that his compatriot Thomas Demand constructs and photographs. Elsewhere, an iPhone pic – titled Utah and taken from a moving vehicle – is blown up so the imperfections show in brush-stroke streaks and blurs. It is nevertheless an image of tonal, almost painterly, beauty that harks back to an older tradition of mid-20th-century American road photographs. But it is the monumental signature works that will attract the crowds to the Hayward. They are all here, and nothing quite prepares you for encountering them together in a single show. Rhein II, which sold for a record $4.3m in 2011, is even more tonally beautiful and emptily eerie in the flesh. Intriguingly, the caption reads “Remastered”, which suggests even more manipulation: in the creation of the original, buildings and humans were removed, thus making it an image of somewhere that does not really exist. Echoing this is the image that hangs alongside it: El Hijo depicts a landscape blighted by litter and acres of industrial plastic covering crops. Made in 2017, it suggests a more overt engagement with contemporary global capitalism and its effects. The extraordinary Amazon (2016) offers a glimpse of the algorithm-generated overload that defines any given day in a single warehouse owned by the company, while simultaneously making you wonder how, in defiance of this seeming chaos, they manage to deliver anything to your door within 24 hours. The stock exchange images, meanwhile, remain breathtaking in their scale and scope, full of telling details such as the discarded printouts littering the floor beneath the traders’ feet. This is a deftly curated show full of echoes and resonances. An image of the Tour de France winding though a French mountainside hangs opposite an ariel image of a Formula One track snaking though the desert in Bahrain. The Aletsch Glacier (1990) resembles a gloomy landscape by Caspar David Friedrich, albeit without any brooding humans, while the minimalist facade of a Toys R Us building abutting a similarly blank Toyota warehouse harks back to the detached gaze of Lewis Baltz and the New Topographics movement that documented the creeping corporatism of American suburbia in the 1970s. For all his iconoclasm, Gursky continually reminds us that he belongs to a postwar tradition of detached looking that began with his teachers the Bechers in Düsseldorf and continued with the likes of Baltz, Robert Adams and Stephen Shore in the early 1970s. But from his evocations of global capitalism to his satellite composites of melting icecaps, he employs digital technology to both challenge the notion of the photograph and do what great photography has always done: show us the world we live in anew. • At the Hayward Gallery, London, 25 January to 22 April. Box office: 020-3879 9555.